And what should the postman have for me yesterday? Why, my very own copy. I’ve read the first few pages and I have to say it’s terrific so far. I took that as a hint that I’d best get on and post the interview. So, who’s it for and what’s it about? 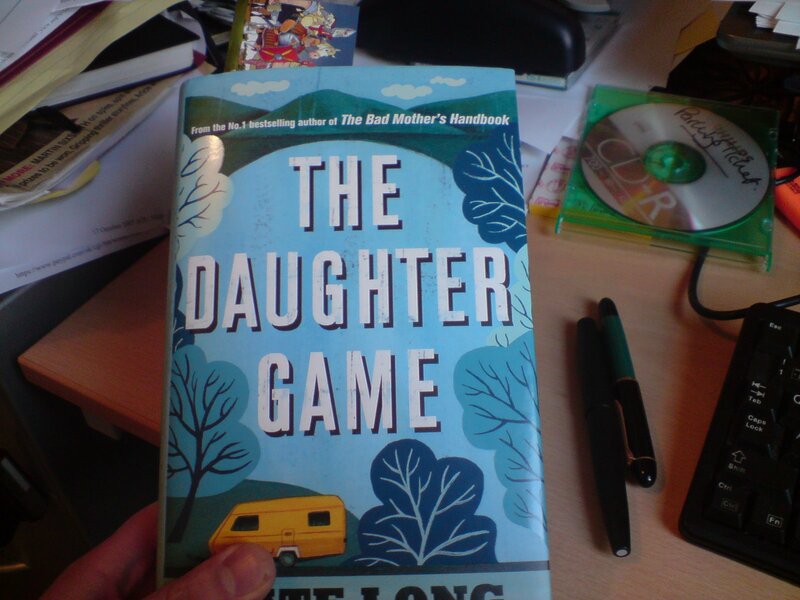 Although my books are sometimes billed as ‘women’s fiction’, I’d say The Daughter Game is aimed at a general adult readership. It follows the story of teacher Anna who becomes over-involved with one of her female students, a troubled and unstable teenager called Kali. Anna’s personal life is an unhappy one, and she gains temporary solace from casting herself as this girl’s special mentor, unaware that Kali is a highly manipulative young woman. As Anna’s marriage breaks down, Kali moves in and starts a series of events that throws Anna completely off course. I’m always interested in the power balance of relationships, the swings and shifts, the capitulations and gains. Also, I was a teacher myself for fifteen years, and I know the strains put upon pastoral carers, and the tricky situations that arise as you struggle to mediate between students, parents and other teachers. What do you hope readers will get from it? An entertaining read, above all else. Though if there is a message to all my books, it’s that we should try our hardest to appreciate what we have rather than focussing on the things we don’t have. Easier said than done, of course, but essentially the secret of happiness is to be thrilled with the ordinary. How do you think it compares to what you’ve written before? It’s definitely more serious, though there are moments of comedy. The ending’s upbeat, but only by a whisker. A year to produce the first draft. Did you use a fountain pen to write it? I always write directly onto the computer, though occasionally I’ll scribble prompts on scraps of paper to get me from one scene to another. Conventionally: married, mother-of-two, Midlands-based, ecologist manqué. I’m currently working on a novel about grandparents’ rights. Last time I was on BBC Radio Shropshire I heard a woman speaking about her campaign to get access to her grandchildren, and I was deeply impressed by her arguments. Always report mink and otter sightings to your county wildlife group. I’d also like to direct you to Jenn Ashworth’s blog. Jenn is most definitely one of my favourite writers at the moment. The stuff she writes for adults is tremendous. It’s bold and delicate and funny and, often, disturbing. Really fantastic. She’s one of these writers with a unique voice – and that’s something I don’t come across every day – let alone a voice that I like. Anyway, I thought her post on short stories was brill and definitely worth a read. And huge congrats to Anne Brooke, whose latest novel, Thorn in the Flesh, was released yesterday. It sounds a very interesting book, and her ‘message’ is something we should all remember.And in the unlikely event I see an otter as I bike about Hoxton and Islington, I now know what to do. And congrats on the new novel, Anne. Thanks for stopping by, Kate. I didn’t realise mink have patches of white. Thankfully (as far as I know) we don’t have them round here, but my eyes will be peeled at any rate.Nik. Aww – thanks for the hyperbolic plug, Nik. I feel a bit bad about not replying earlier, but in my defence, I had a little bump in the car and banned myself from computering until my neck recovered.I really liked the way you pointed out my writing is for adults. That makes it sound like it might be rude. I’m not very good at writing rude things, but I am going to try harder now so I don’t let anyone down.